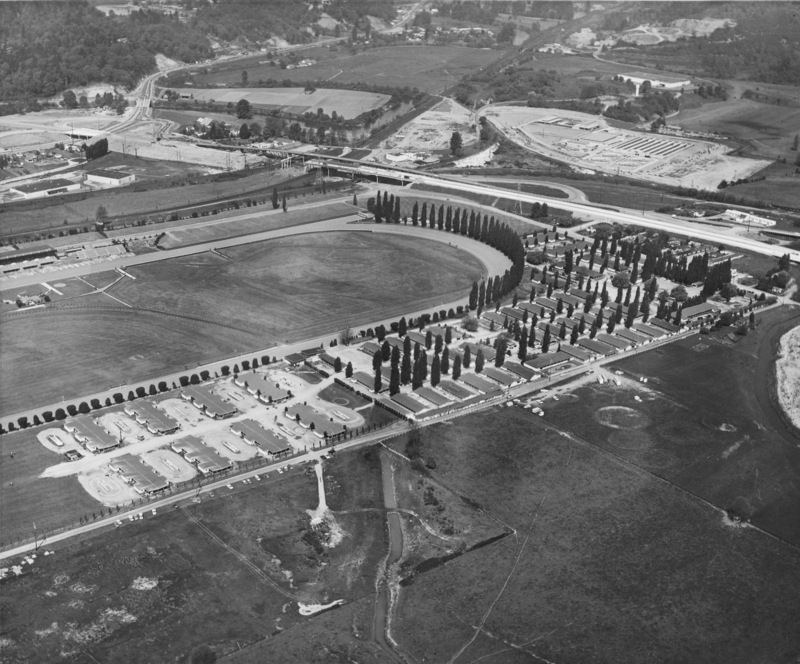 Longacres Racetrack may be gone now but she lives on in people’s hearts. So many have reached out to me from the documentation I have recently done on The Ruins of Longacres. One of the most gracious has been Bill Taylor. Bill right away sent me a photo of the Entrance Units under I-405 when I posted my first article called Relics of Longacres. Link to article In the last month he sent me this series of aerial photos. 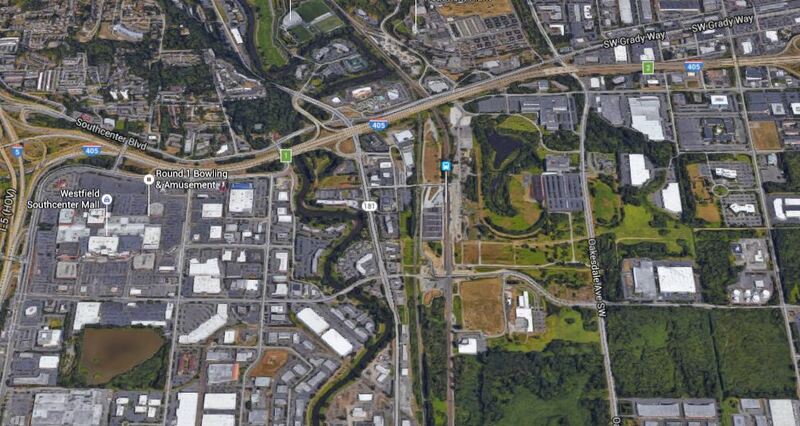 Most of them are from the early 60s when the freeway was under construction and Southcenter Mall was just a dream. Let us jump right into things! 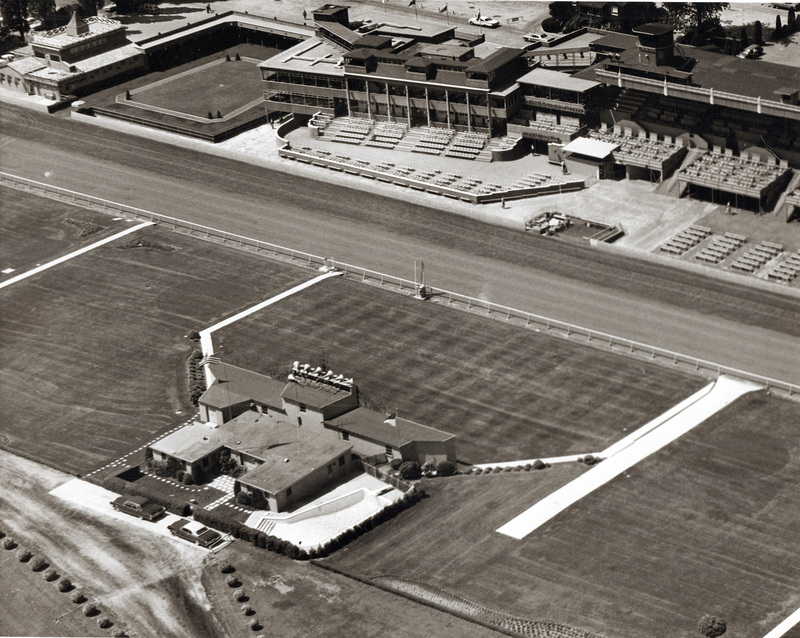 This first picture that was the opener is of the racetrack in 1959 when the Green River flooded. These next two pictures are from the 1960s. 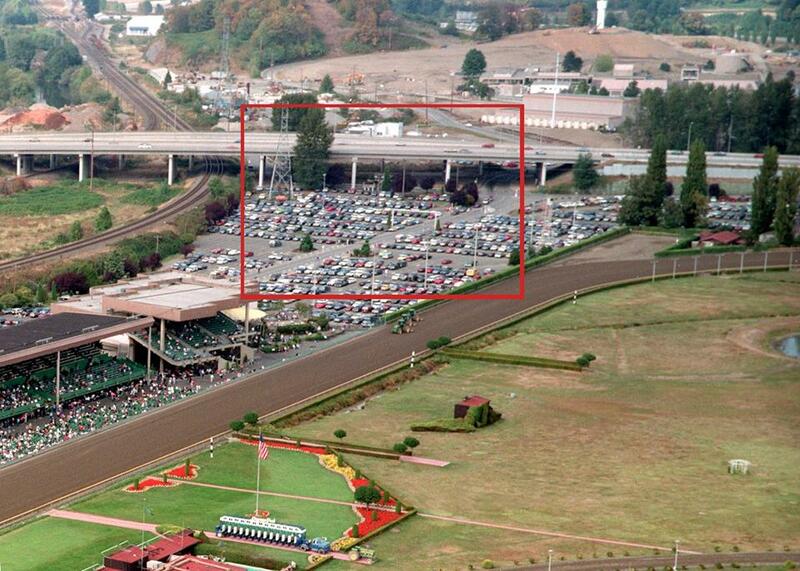 The arial is the Mile Day (Longacres Mile Race) showing a packed parking lot and grandstands. The second is the running of the Rainiers which should put a smile on your face. Bill sent me this wonderful piece of Longacres art that only one print was every made of. 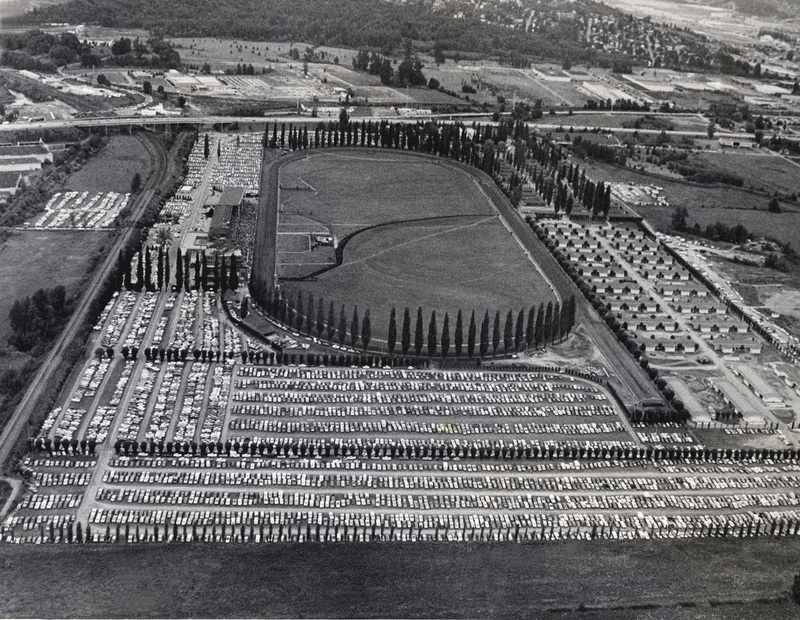 Notice the lombardy poplar trees that are a signature of the track. Mt Rainier is peeking in behind the trees. 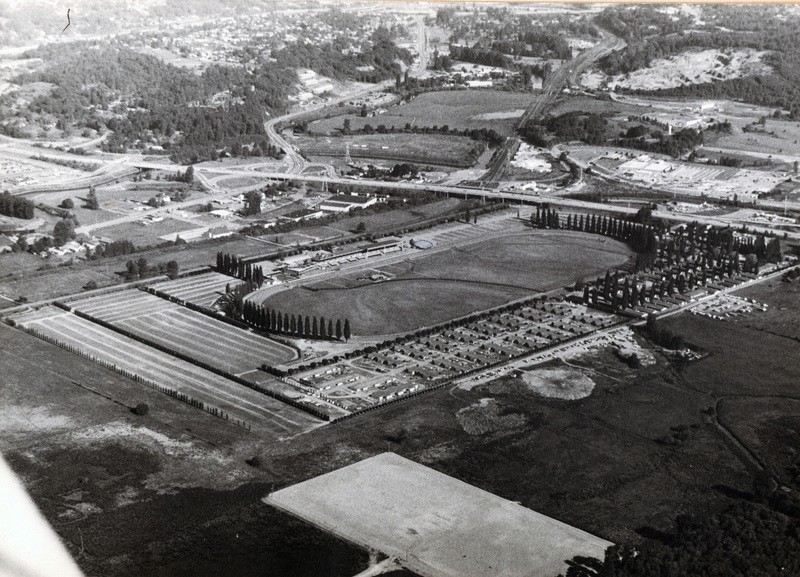 Next are a series of photos of I-405 being constructed. This has to be before 1965. 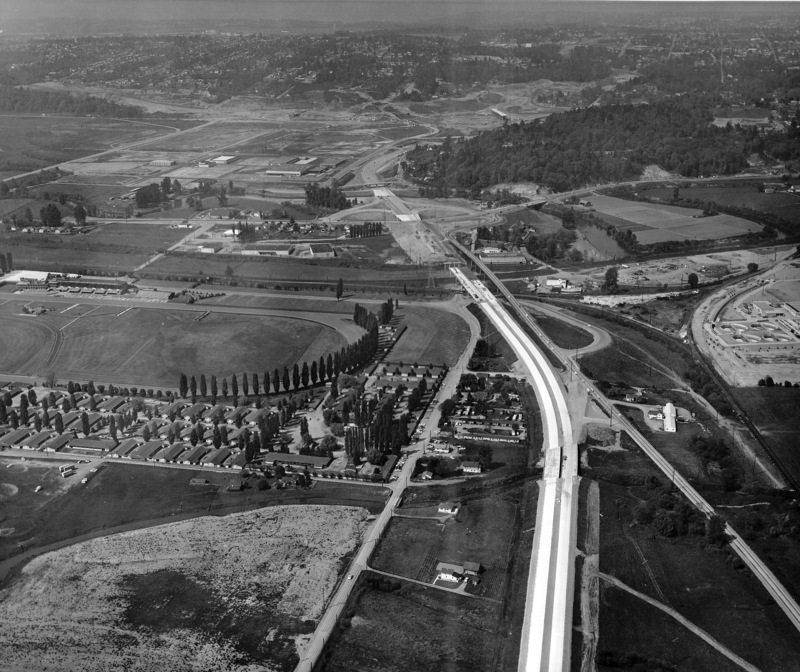 That was when the first piece of it was opened between Tukwila and Renton. 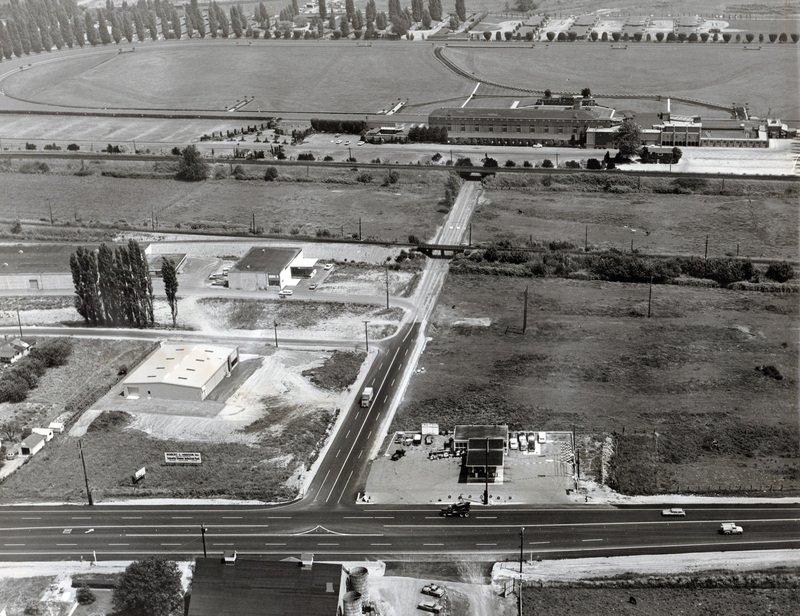 I have done some more research around the entrance units that are now under the I-405 with these photos. They are not visible on any of them best I can tell zooming them in and out. There is an additional railroad spur about where they are. This old spur has been gone so long that when I went back to the site I cannot find any signs that it ever existed. Look closely yourself and see what I means. Continuing on the entrance units concept here is another picture Bill sent me earlier. It must be in the 80s since the additional grandstands are built. Note the red box highlights where you can see the two entrance units under the freeway. Somewhere between the freeway construction and then they were moved there. 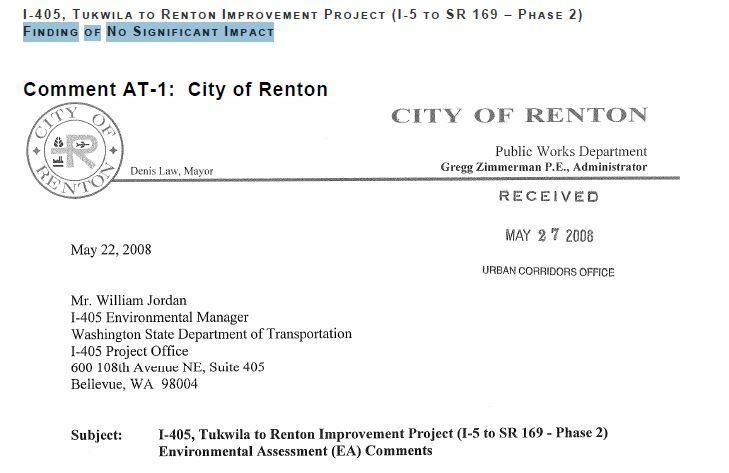 In my research I found a letter from the City of Renton to the Washington Dept. of Transportation. One of the items was asking them to save the units. 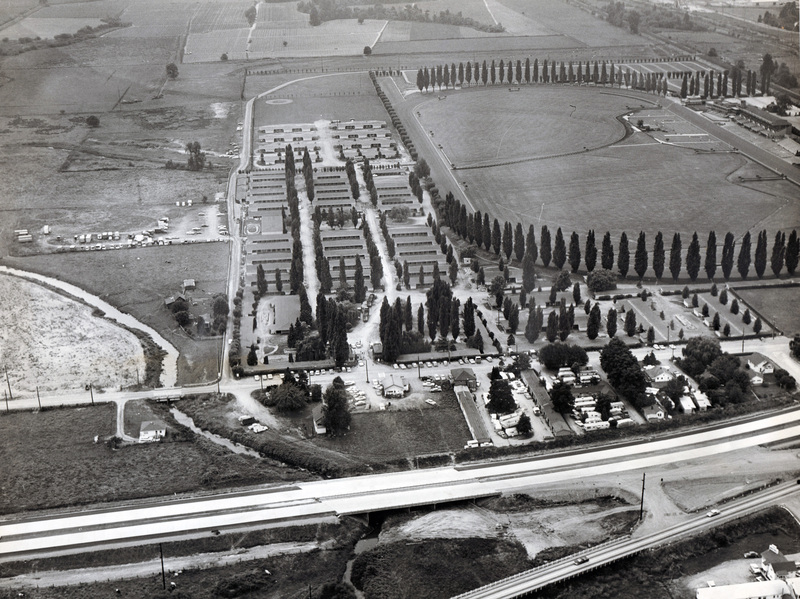 The WADOT stated they did not qualify since they were put there since the freeway was built. Not what I thought at first but it seems to fit the pictures above. 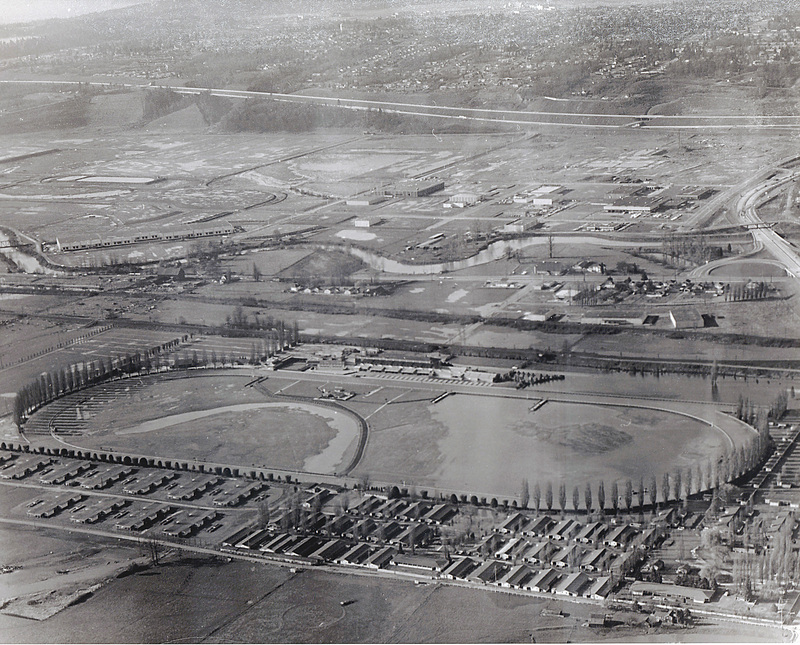 The WA DOT has it wrong though about them being moved there when the racetrack was destroyed or sold to Boeing. Does anyone reading this have knowledge of these two units? Where did they come from and when did they get installed under the freeway? All good things to know if and when the State decides to move or destroy them. Back to Bill’s historic pictures. 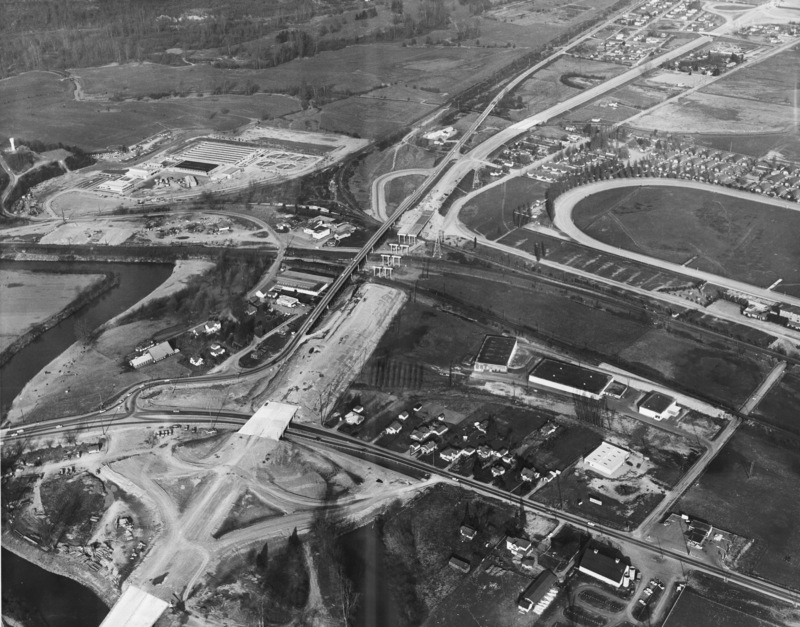 Here are three more showing what the area looked like about 50 years ago. I have added a google map view for your comparison at the end. I have included Southcenter in this Google Map snip so you can compare that to the next photo too. One feature of Longacres that Tina (remember how she helped me find ruins one day?) told me about was the house behind the scoreboard. It had a pool even. Bill rounded out the photos he sent me with one of the house. I have to thank Bill again for his generosity in sharing his photos and knowledge. 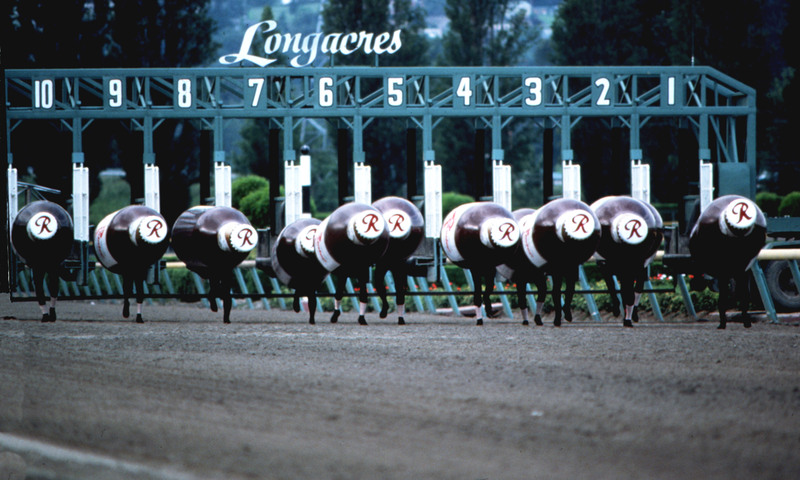 If you want to know more about Longacres today here is a link to the first article. Erm. 🙂 What the heck? I would be tickled to hear WHAT I’m looking at in that photo! AH! So that be people in those intriguing costumes. I thought so, but… Thanks for the explanation! Thanks for the memories. I spent many magical days there from 1972 until closing day. I met many friends there & have thought about having someone sneak in & spread my ashes by the finish line when I die as I had many a thrilling moment there. I still have a form & program from the last day. A friend of mine who passed a few years ago, Sol Saporta, wrote something in one of his books about horse racing fans that I love. ‘Every racetrack is populated by gamblers, touts, hustlers, and bookies all with a little larceny in their hearts, which, paradoxically, makes them a cut above the average citizen when it comes to honesty, decency, and integrity’. 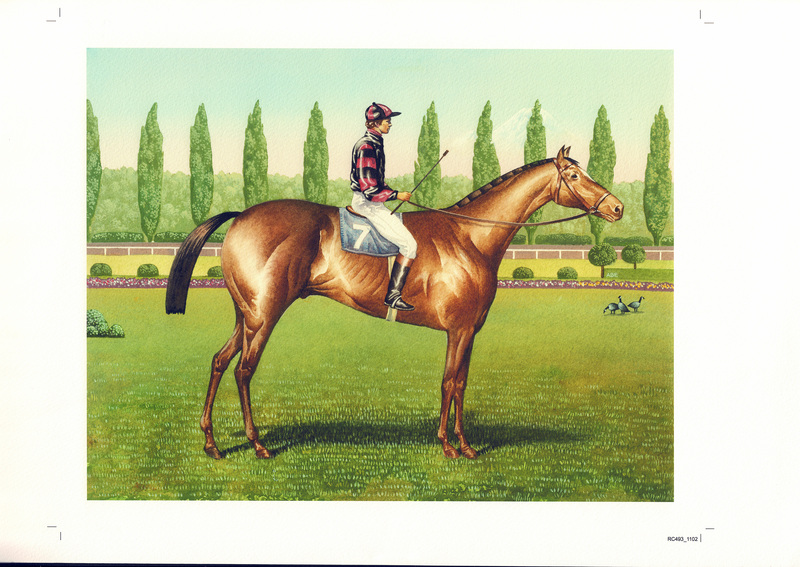 He was at Longacres almost every day of the racing season. I miss him & I miss Longacres, what a beautiful track! Such great memories! Steve – this is why I did the articles on Longacres. It is slipping away from us as others forget what was in Seattle. I would ask you if you think I found the right place as the finish line. It was really hard considering what was left. If you have any pictures to share I can add them too.